Conversion tools from hypervisor vendors and third-party companies can help you overcome virtual machine migration challenges. Find out which conversion tools are right for you. Virtual machine migration is an important part of an IT administrator's job. Conversion tools enable administrators to transport workloads from any physical or virtual source to any physical or virtual destination. They also aid in server consolidation projects, because physical-to-virtual (P2V) conversions are a great way to jump-start a new deployment. Even in more advanced virtual infrastructures, virtual machine migration tools still come in handy for moving more complicated workloads. But not all conversion tools are created equal. In this tip, I highlight some of the best conversion tools, their capabilities and how they can make a virtualization administrator's job easier. VMware vCenter Converter is one of the most popular conversion tools, primarily because it comes as a vCenter Server plug-in and is fully integrated with the VMware product line. (It's also available as a free, standalone product that can run outside of vCenter Server.) VCenter Converter is a unidirectional tool; it performs migrations only from physical or virtual systems to VMware-based VMs. 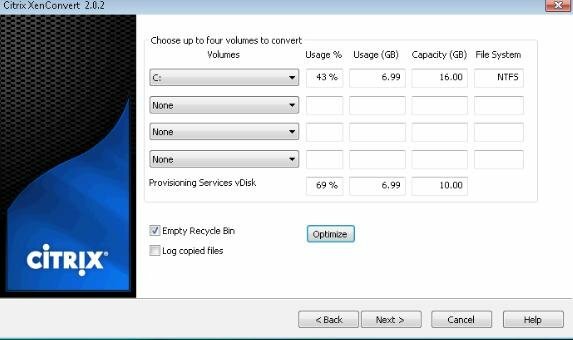 Among the free and generally nonautomated tools, I use Converter most frequently because of its advanced features, including synchronization of changes, the option to install VMware Tools on a new guest VM and the ability to control Windows-based services on a destination VM. Microsoft System Center Virtual Machine Manager (SCVMM): Any virtualization platform worth its RAM has a native way to import physical workloads and VMs. Hyper-V's management console, SCVMM, includes a feature that converts physical servers and VMs to Hyper-V's Virtual Hard Disk (VHD) format. SCVMM converts physical servers and VMs to the VHD format. Click image to enlarge. Citrix XenConvert is part of Citrix Systems' XenServer hypervisor, and it is the native conversion tool for the Xen hypervisor. This tool migrates Windows systems and has VHD support as well. XenConverter lets you convert up to four volumes at a time. Click image to enlarge. Vizioncore vConverter: Hypervisor vendors aren't the only companies making virtual machine migration tools. Vizioncore vConverter is one of the more flexible tools, because it can convert any physical or virtual system to one of many virtual platforms, including Hyper-V or Virtual Server, XenServer and VMware. VConverter also performs virtual-to-physical migrations. The free version can perform most migration options, but continuous data protection and disaster recovery features come at a slight cost. Various traditional backup products -- including Acronis Backup and Recovery Server for Windows, Symantec Backup Exec and several Double-Take Software products -- can also function as conversion tools. As point products for performing P2V migrations, all these tools do a fine job. But what if you need to migrate a large number of systems? Simply converting a workload is one thing, but creating a larger, overarching consolidation plan is an entirely different ball of wax. PlateSpin Migrate is among the most powerful options for conversion tools. PlateSpin Migrate converts Windows, Linux and Solaris systems to a half-dozen of the most popular virtualization platforms. It is the most full-featured conversion tool because it can migrate physical systems to both VMs and other physical machines, and vice versa. The tool can also perform automated conversion tasks imported from PlateSpin Recon, a popular consolidation planning tool. In addition to the conversion tools and methods mentioned above, offline migration is another approach to migrating VMs in VMware environments. Offline migration ensures that the system you migrate does not incur updates that you don't want to replicate to a destination VM. The most recognizable offline migration tool is VMware's Cold Clone boot CD that is part of vCenter Converter. Another popular offline migration tool is the Ultimate-P2V boot disk from Mike Laverick's RTFM Education site. Ultimate-P2V has a number of community contributions that make the tool relevant to administrators' needs. Both conversion tools work in a similar fashion: by launching in a bootable environment. Most VMware installations rely exclusively on VMware vCenter Converter to migrate machines into vSphere, because it is good enough and easy enough to use. But there are caveats. Each virtual machine migration tool works slightly different. Where one tool may fail on a conversion, another may complete the task successfully. On a few occasions, I've had vCenter Converter fail, for less-than-intuitive reasons -- even after reviewing the local logs. A quick pass using Vizioncore vConverter successfully imported the workload to a VMware VM without issue. Regardless of the conversion tools you use, the goal remains to preserve the operational integrity of the VM -- removing hardware drivers and devices from physical components, provisioning system resources, and ensuring application availability. The conversion tools on the market are robust, but none can automate the entire process throughout the stack. Rick Vanover (vanover-rick@usa.net), VCP, MCITP, MCTS, MCSA, is an IT infrastructure manager for Alliance Data in Columbus, Ohio. He is an IT veteran specializing in virtualization, server hardware, operating system support and technology management.